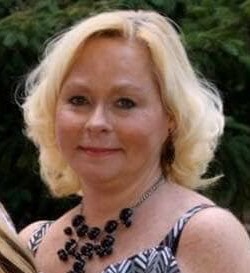 EVERETT, Anita Dodd, 55, of Mechanicsville, VA went home too soon, on Thursday, March 21, 2019. She was preceded in death by her maternal grandparents, Mr. and Mrs. Raymond Aldridge Sr., and paternal grandparents, Mr. and Mrs. Gilbert Hastings; and uncle, Tom Anderson, and her in-laws, Mr. and Mrs. Howard Everett. Anita is survived by her children, JR Everett and Samantha Everett; her parents, Mr. and Mrs. James Dodd Sr.; a sister, Teresa Parrish (Brian); brother, James “Jimmy” Dodd Jr. (Heather); nieces and nephews, Nicole, BJ, Cody, Zack, and Abby; great nephew, Huxton; aunt, Rayline and uncle Woody; and the father of her children, Jeff Everett Sr. Anita had a passion for teaching and enjoyed over 20 years of educating students at Hermitage High School Votech, where she was voted teacher of the year. She was a people person and had a smile that endeared her to others. She cherished her time spent with her beloved family and friends. The family will receive friends from 5 – 7 pm, Monday, March 25m, 2019, at Monaghan Funeral Home, 7300 Creighton Pkwy., Mechanicsville, VA 23111 where a Memorial Service will begin at 7 pm.